Since the last post, I have been quite busy. I have commenced more spline construction round the corner from Kankool onto the first peninsula section. I have also now completed the second peninsula with wall frame. 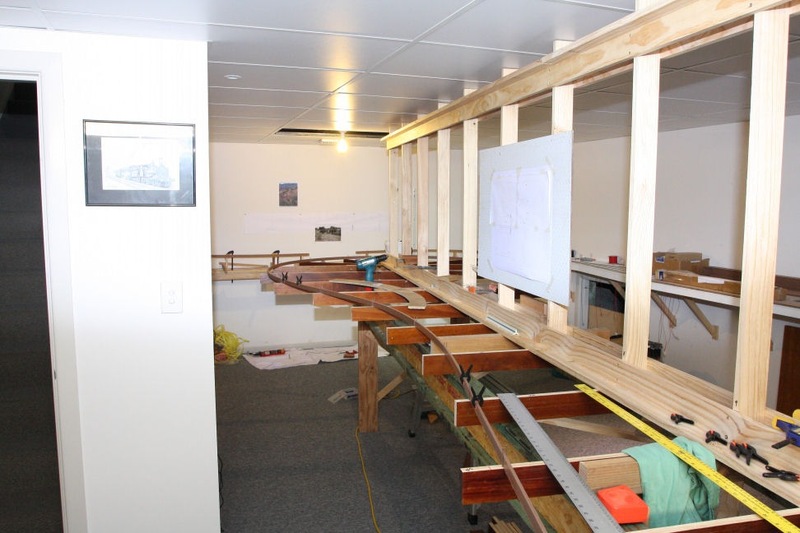 Below are some shots of the benchwork during construction. 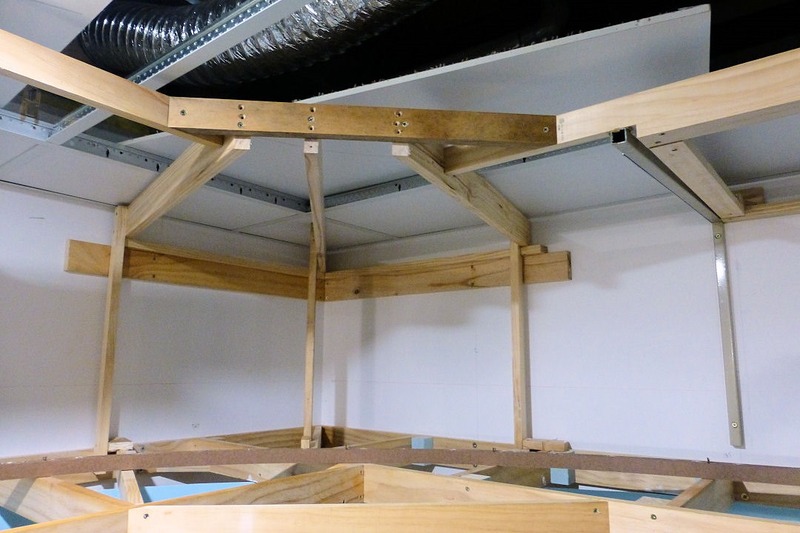 I am amazed at how sturdy the whole structure is now it is complete. 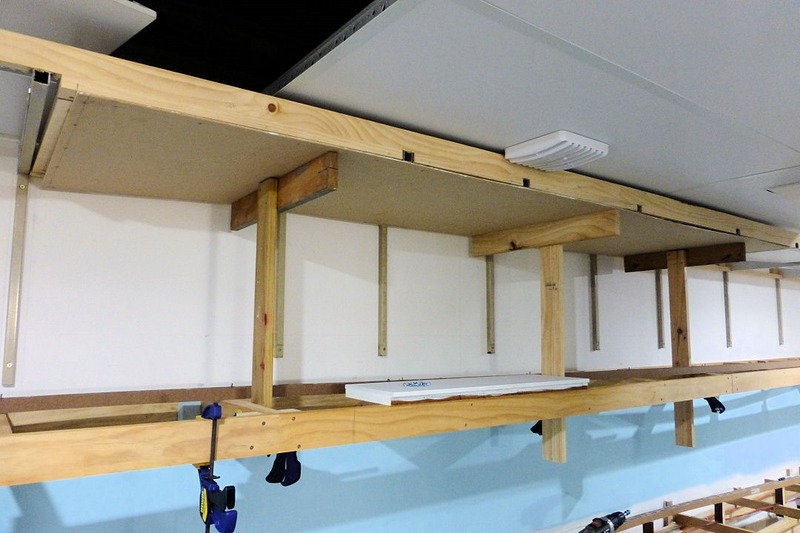 I was thinking I may have had to secure the wall to the floor joists above the ceiling tiles, but I found there is no need to. To give some idea of size, this main peninsula is 8 metres long. 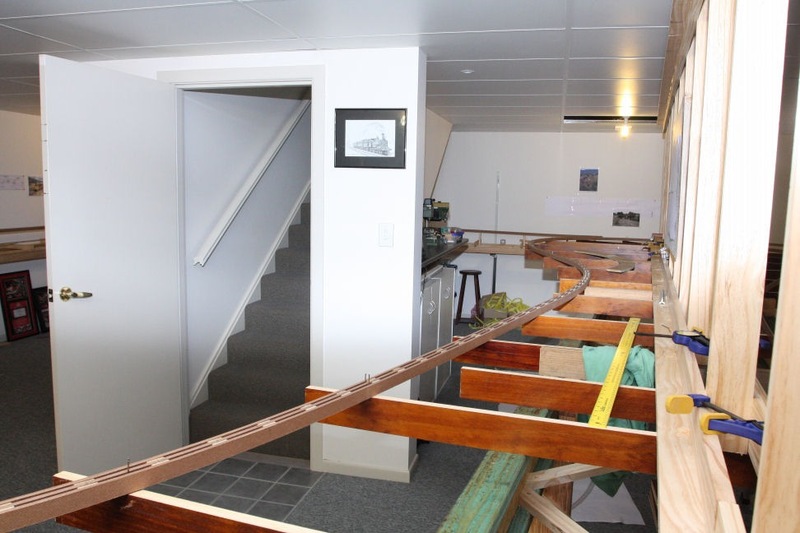 Just to finish off this post, the above photo shows the spline continuing along the first peninsula section from Kankool and onto the main peninsula. 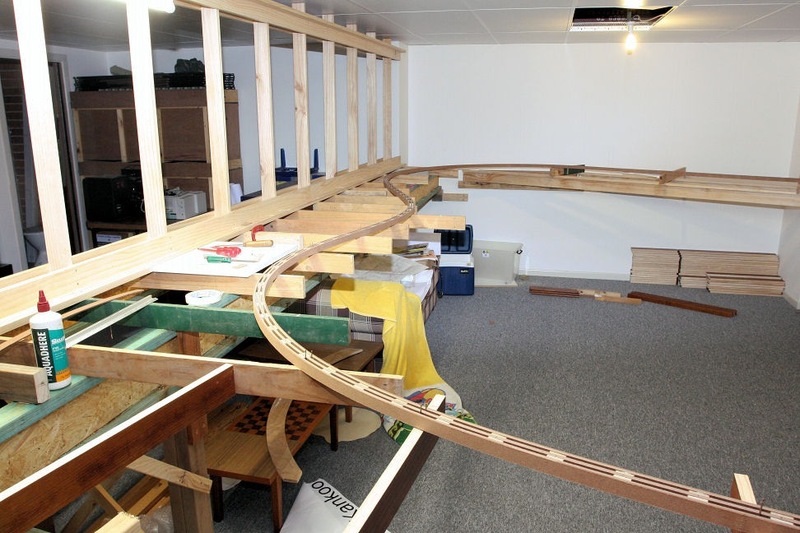 It’s amazing now that I have most of the main benchwork up, how I can get more of a picture of how the layout will look. Up until now, it’s just been a two dimensional drawing; very difficult to imagine how things will look. But now I’m starting to visualise scenery and track elevations. All good fun!! Well, I have finally completed the section of spline through Kankool. 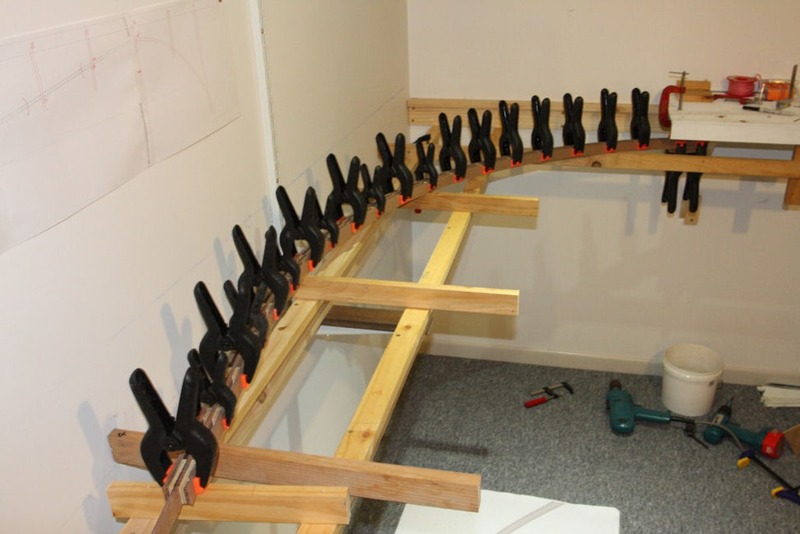 As mentioned previously, this section has been slow going because, as can be seen, there has been quite a lot of gluing and clamping required, but the end result is very pleasing. 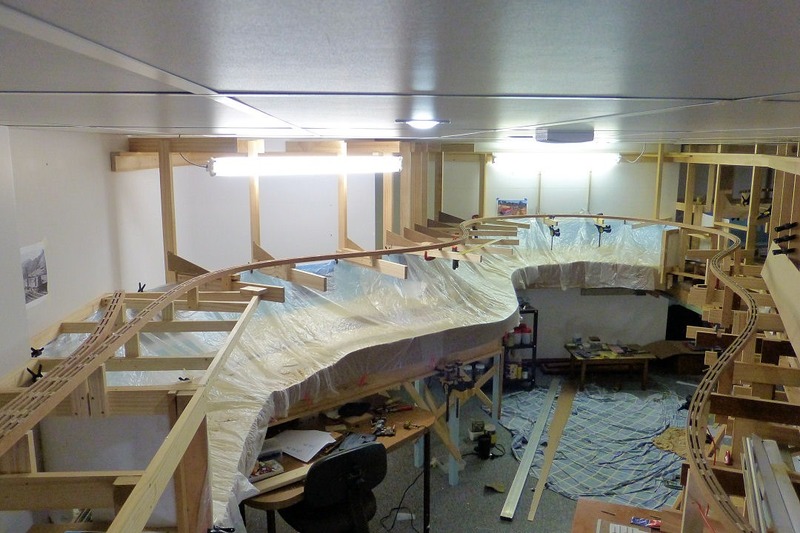 This shot also shows the effectiveness of spline to achieve flowing curves with easements, something that would be very difficult to do cutting out from plywood. 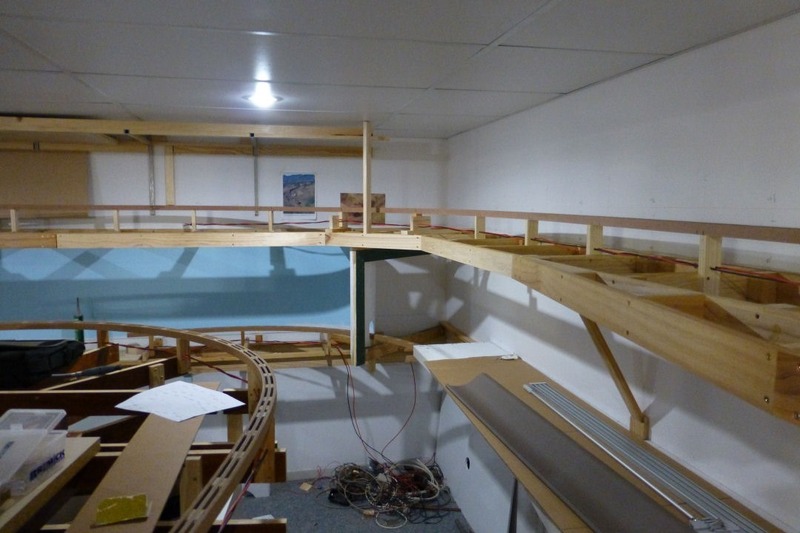 The roadbed is still only on temporary risers/joists at the moment, until I get more spline built so that I can start to set the grade from the bridge. 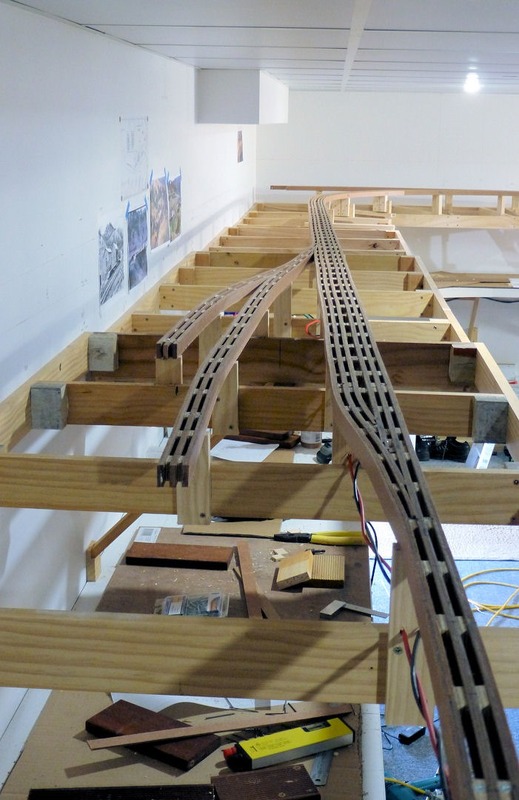 The top surface of the spline is yet to be ‘smoothed’ off prior to laying track. Another view of the spline through Kankool towards where it turns left along the first peninsula. The next task is to set out the next peninsula so I can continue with the spline. 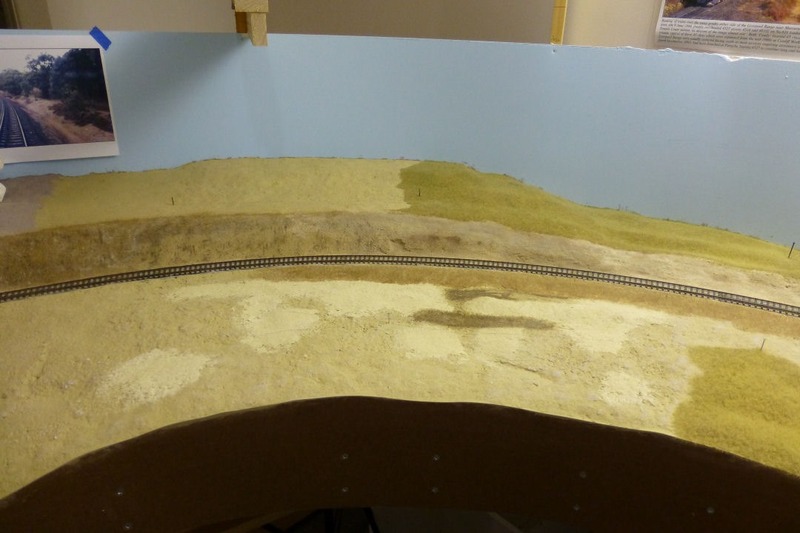 Over the next few months, I may make a start on some scenery, if not the Chilcotts Creek bridge. Well, things have been progressing really well on the spline since my last post. 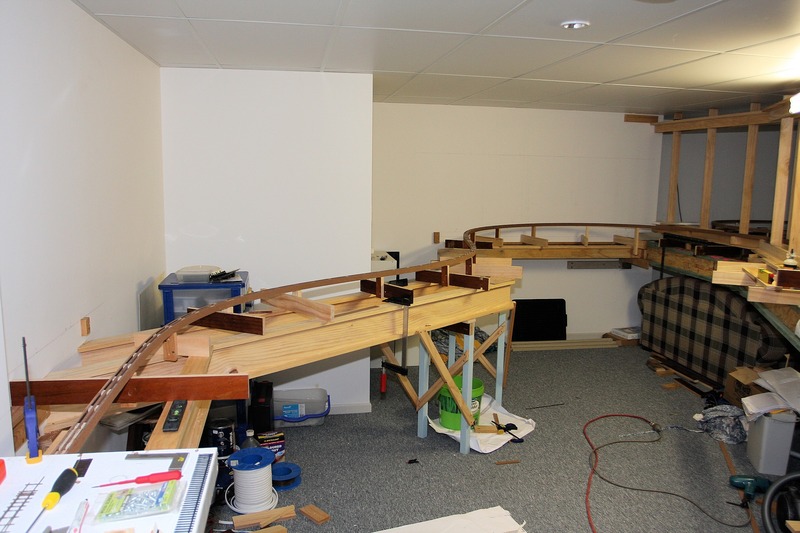 Spline is in place all the way to the first turnout at Kankool now, where I have split the spline. 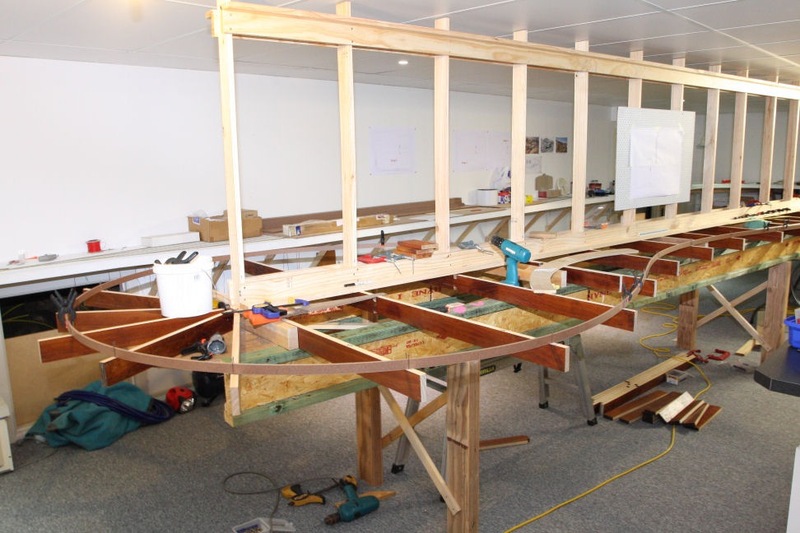 But first, some pictures of the construction sequence so far. After the two centre strips are in place and glued, the next step was to attach the spacer blocks. These were placed at 100mm intervals. 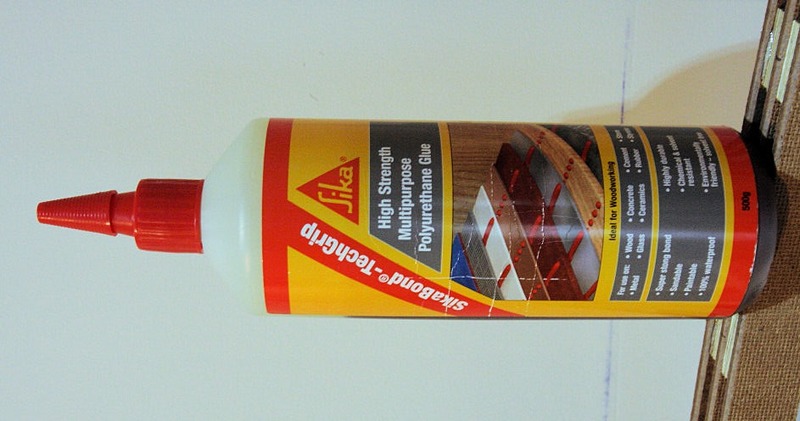 The glue I am using is a polyurethane product from the SIKA range. I was originally going to use a Liquid Nails type adhesive, but this is not very easy to dispense from the caulking gun and it ‘skins’ pretty quickly once exposed to the air. The SIKA stuff is not cheap at around $15 per 500g bottle, but as I am using only small amounts, I think it will go a long way. It also says, as it cures, it slightly expands into the timber grain to achieve better adhesion. It is also waterproof. The next step was to work out the position of the bridge. After allowing for the abutments, I worked out where I would terminate the spline either side. 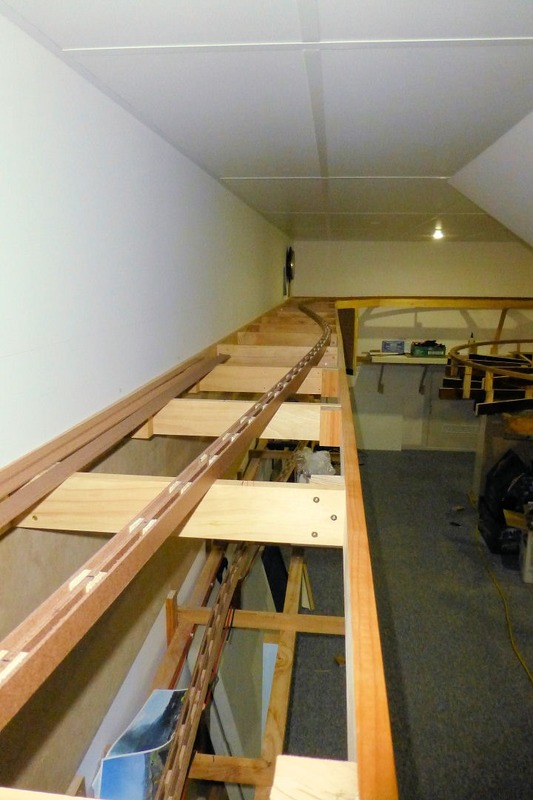 Then came the installation of the outside spline strips. These would go up to the start of the bridge only, as I couldn’t see the point in continuing the full spline across the bridge gap, only to remove it later for the bridge. The centre spline however did go across the gap only for alignment purposes for the continuation of the spline on the other side. 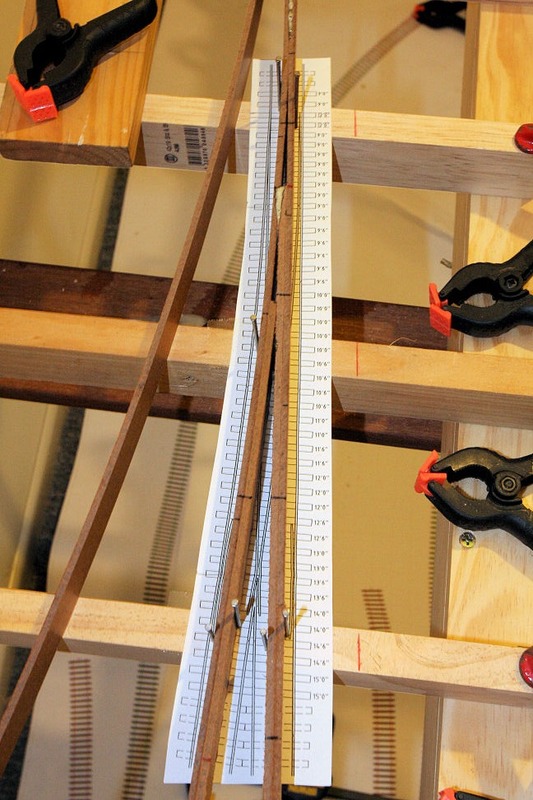 The process is quite slow, as I have been allowing at least 3 hours for each glue/clamp process before proceeding, although whilst one section is gluing, I can be gluing more spacer blocks in place for the next section. 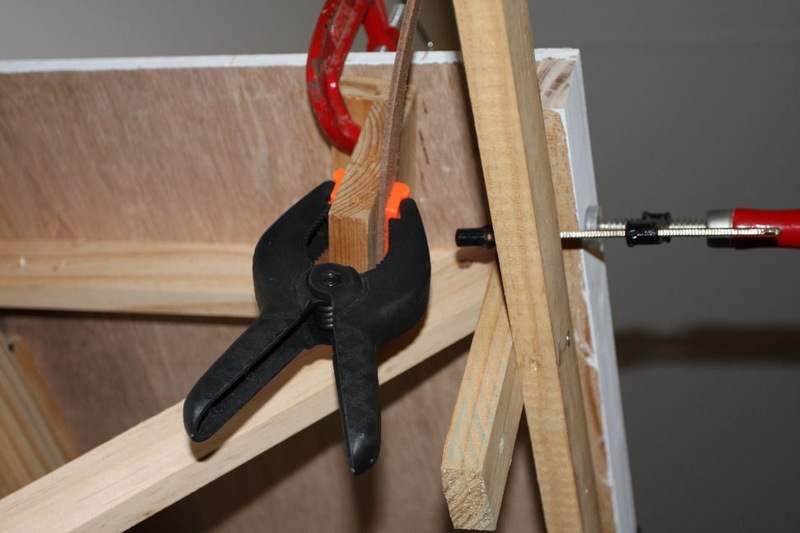 It all depends on how many clamps you have! 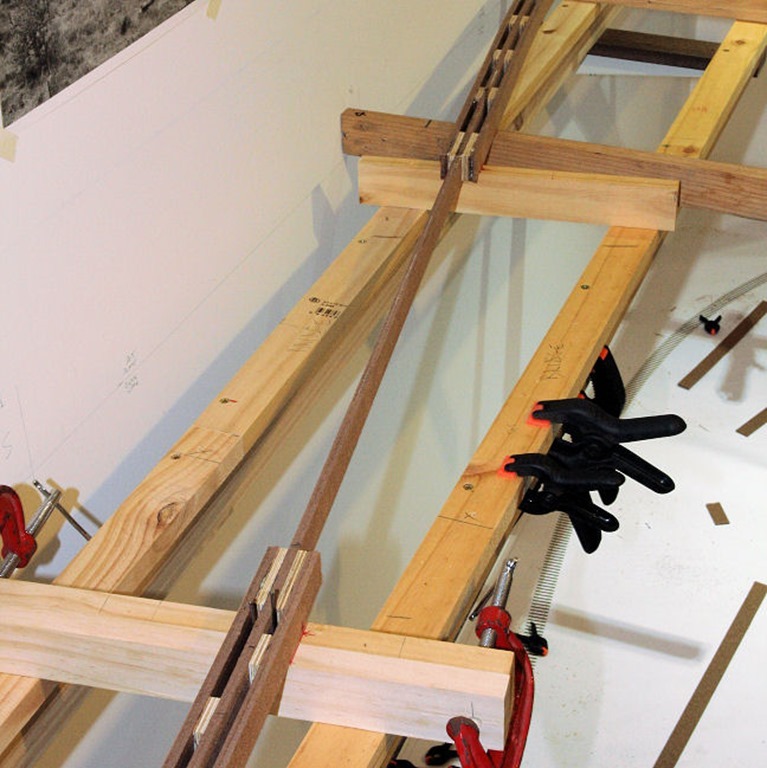 I try to glue and clamp as much as I can in one session. The photo below shows where I was up to on the 18th. Full spline from the storage yards to about two thirds the way along the wall towards Kankool. In the background, note the location of the bridge where the centre spline only is present. This section has now been cut away. 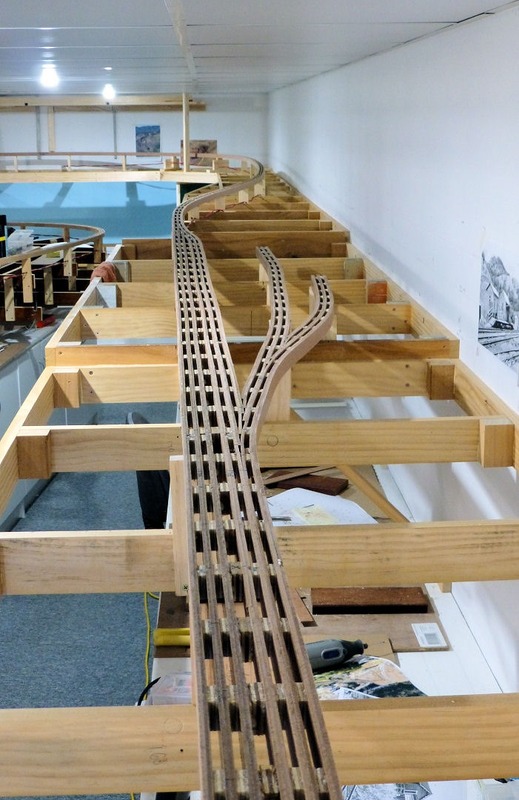 Note how nice flowing curves can be achieved with spline roadbed. 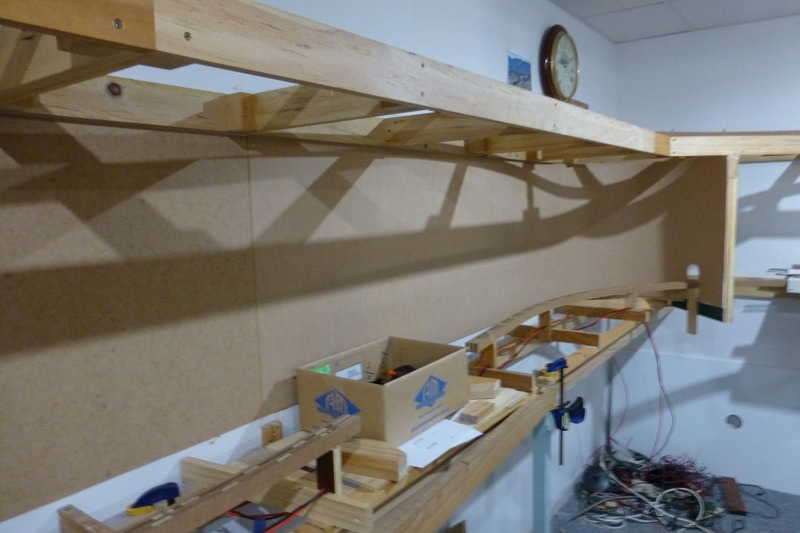 During the week, I also erected the next section of benchwork where Kankool will be (well, half of it anyway!). 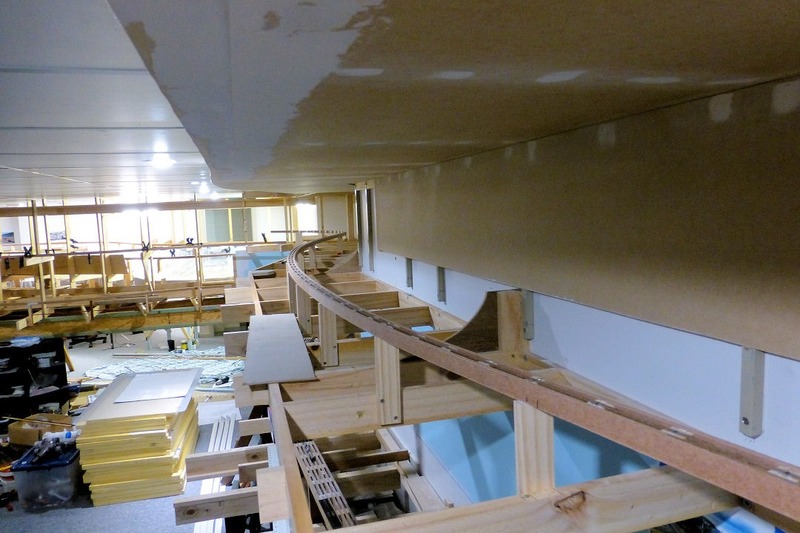 Longer shelf brackets were used here, as this section of the layout will be deeper than where the bridge is. 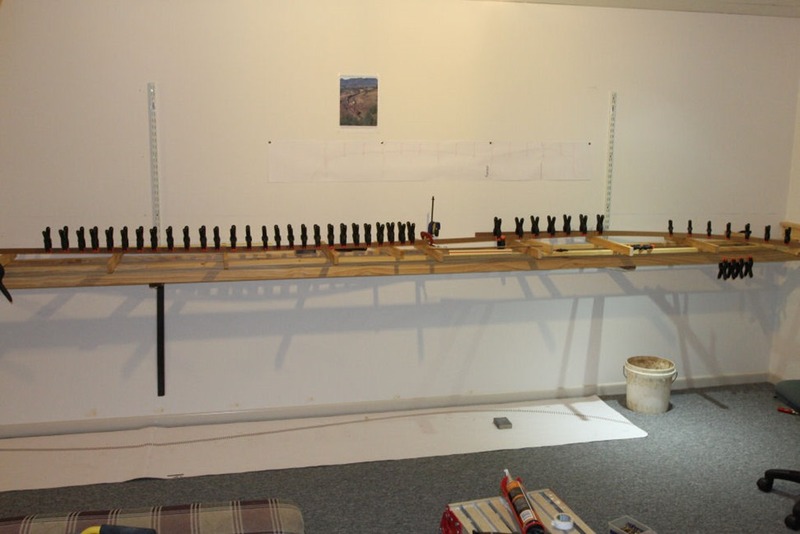 Again, L girders were made from 3×1 and 2×1 DAR pine. 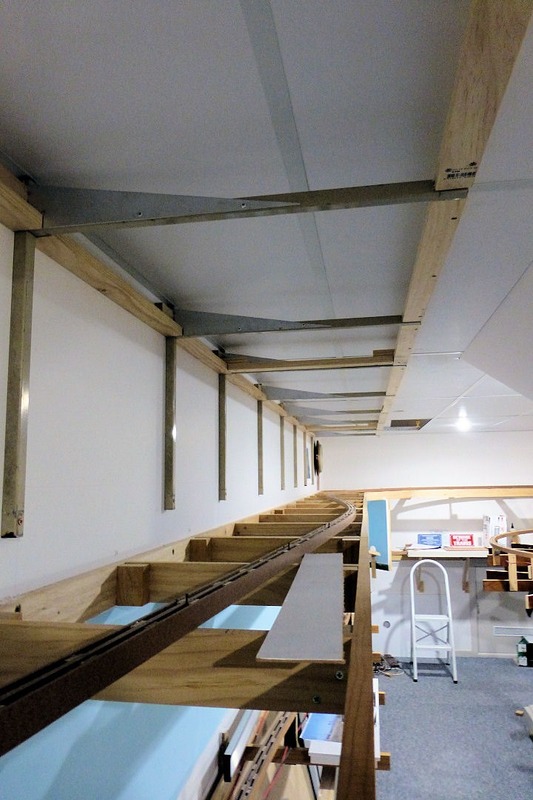 Temporary joists were placed to allow for spline construction. These will probably be relocated as I set the elevation of the spline later. Work on the spline continued around the corner and up to where the first turnout will be at Kankool. 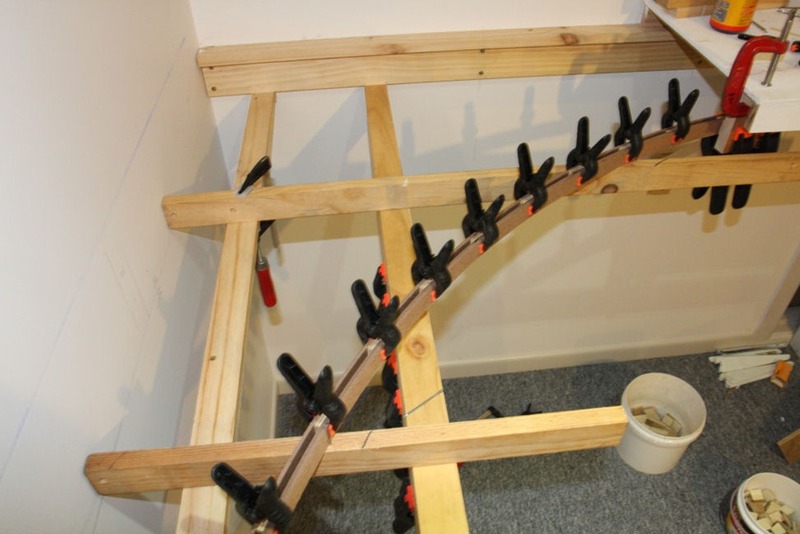 Over the last few days, I have been working out how to make the spline through the turnout area. Whilst researching spline construction on the net, I have come across a number of articles which have helped in the process. One of these was very comprehensive, and is here as a PDF. 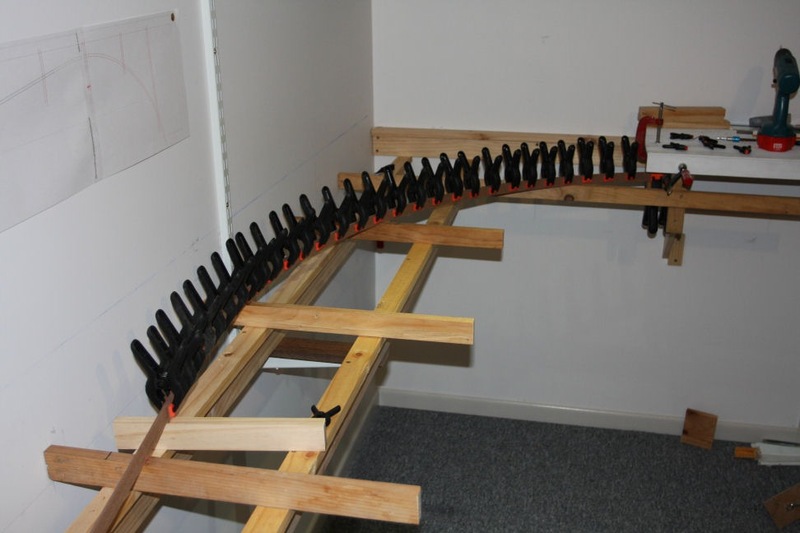 There is a section in the article about how to make spline under turnouts, so I have tried the method which involves splitting the centre spline strips so one continues straight and the other one follows the diverging route through the turnout. Hopefully this is explained better in the pictures below. 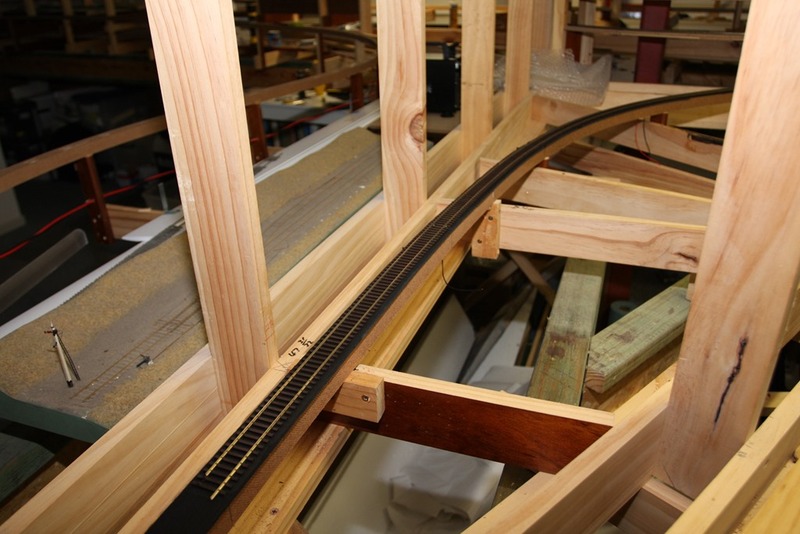 As with previous sections of spline, the two centre strips are located on the track centreline and held with nails. I then placed a drawing of the 1 in 8 turnout over the top to work out its location. It was then placed underneath the spline so I could line up the strips. As can be seen, the outside strip has been split away from the other one to follow the diverging route. 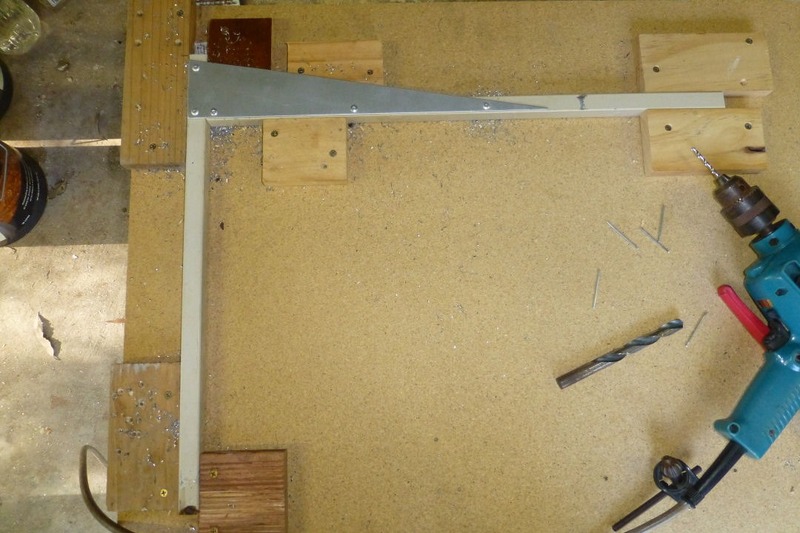 Then it’s just a matter of starting the spline again within the turnout, all the time holding it in position with nails. 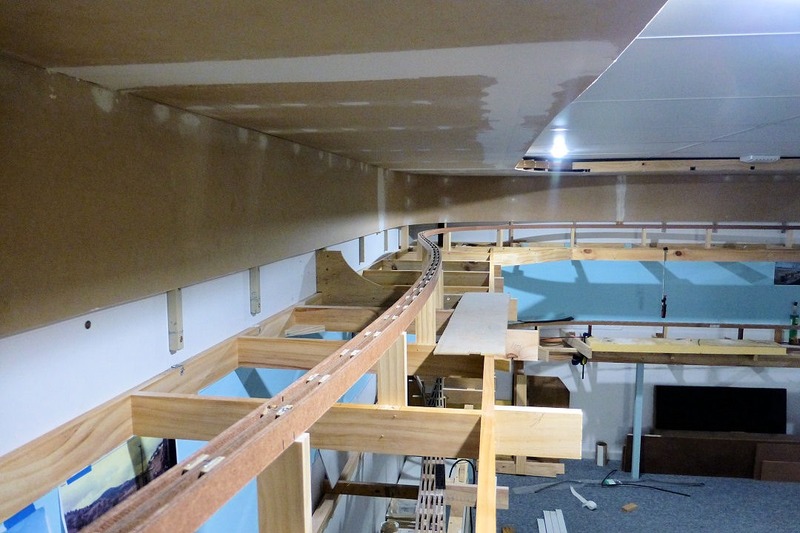 Then more spacer blocks and continue on with the spline down both routes. 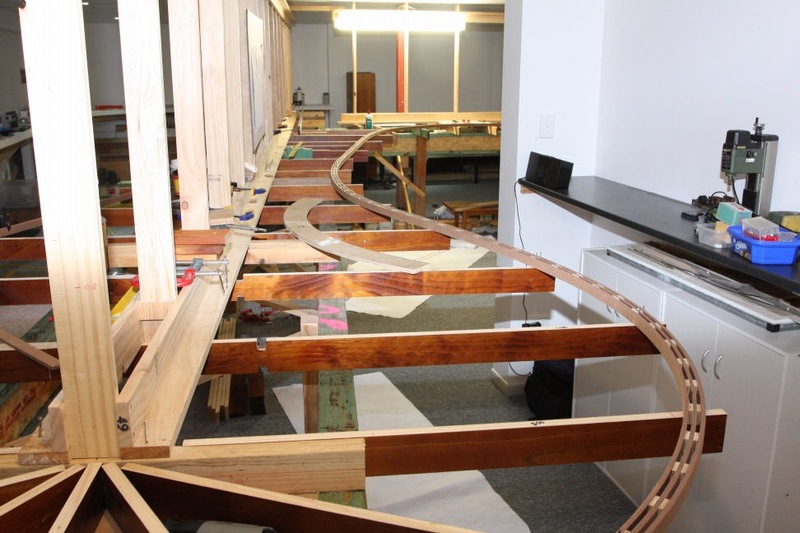 At this point, I’ll only be completing spline up to this turnout, as I want to build the next section of benchwork for the next half of Kankool, so I can get the curve correct and around into the centre peninsular. Finally, to finish this post, a few shots back at the bridge area. 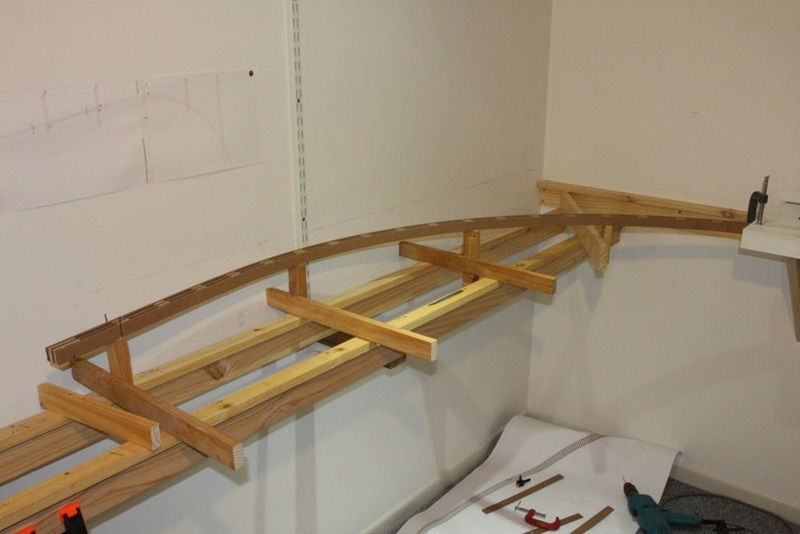 I took the plunge and cut away the section of centre spline through the bridge gap and commenced setting the first section of spline on risers at the correct elevation. 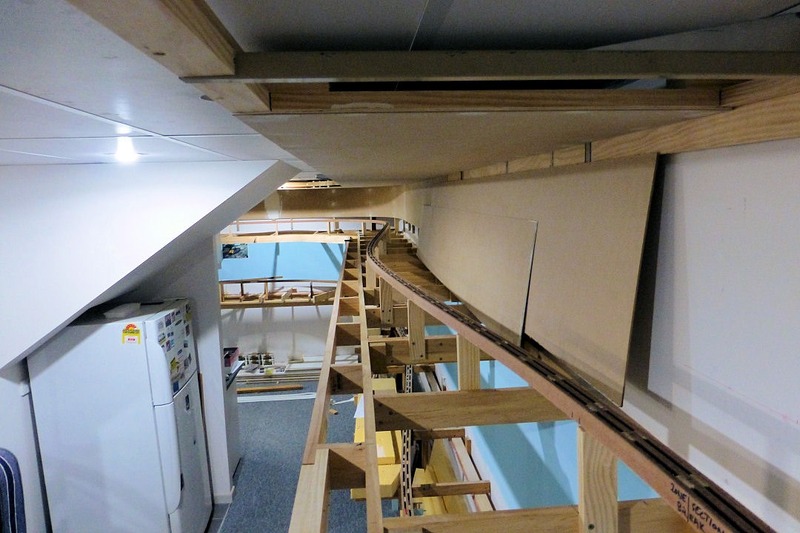 Once the first section was cut away at the bridge, I then had to work out how I was going to attach the spline to the storage yard plywood. 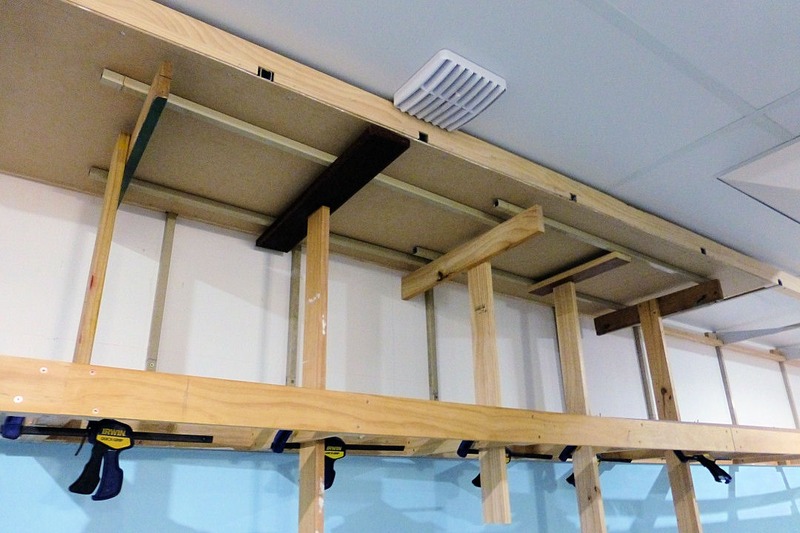 With the ply being 9mm thick and the foam underlay being 3.5mm, I had to remove 5.5mm from the top of the spline at the storage yard end for about 100mm. 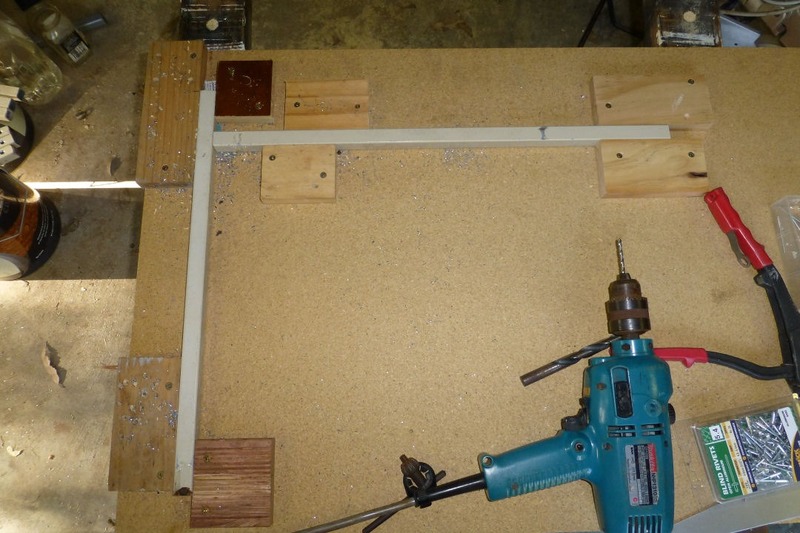 I ended up taking the section outside and placing it in a jig to allow a small router to be set at the correct depth. It ended up working out nicely. 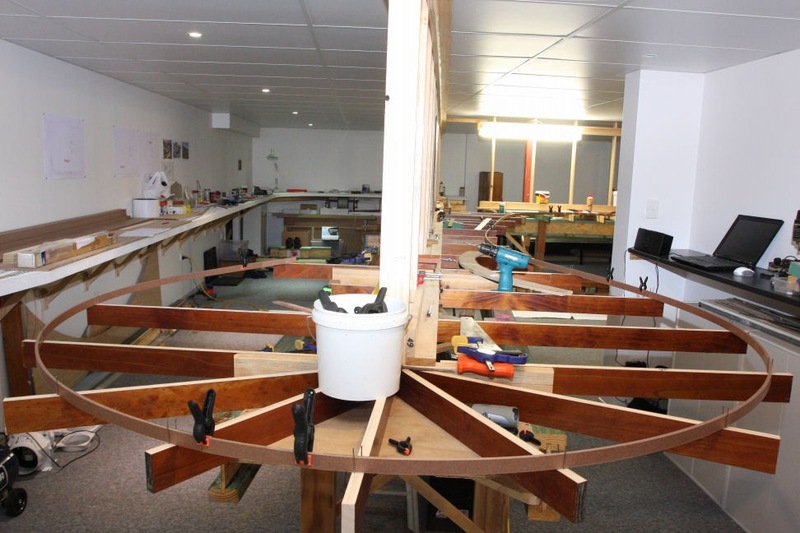 The spline was then placed back in situ and test fitted. PERFECT!! 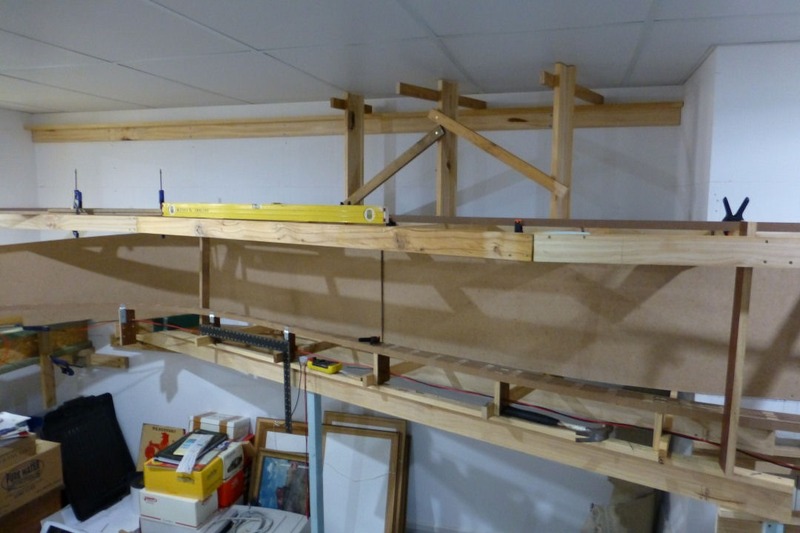 I then cut some risers from 2×1 DAR and set the height of this section to 42”, same as the storage yards. 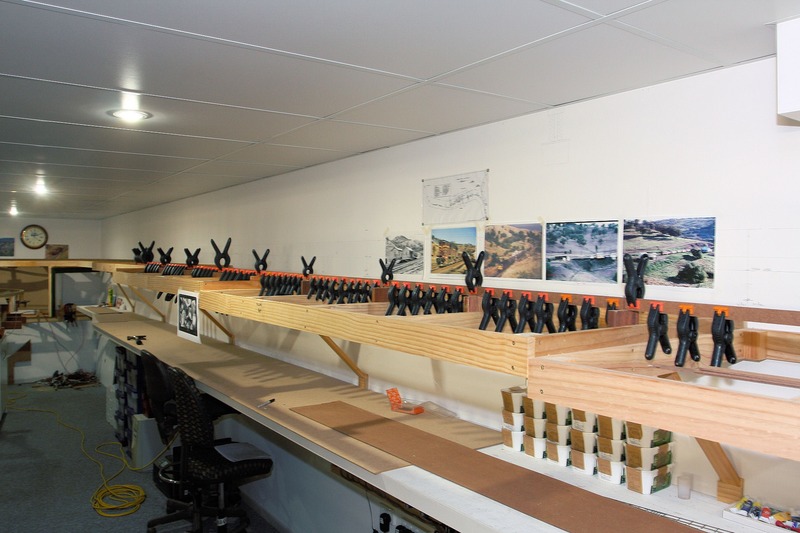 That means that the grade now begins from the Kankool side of the bridge, as in the prototype. This meant I had to recalculate the overall grade from the bridge to Ardglen in 3rdPlanit, but it hadn’t changed all that much. 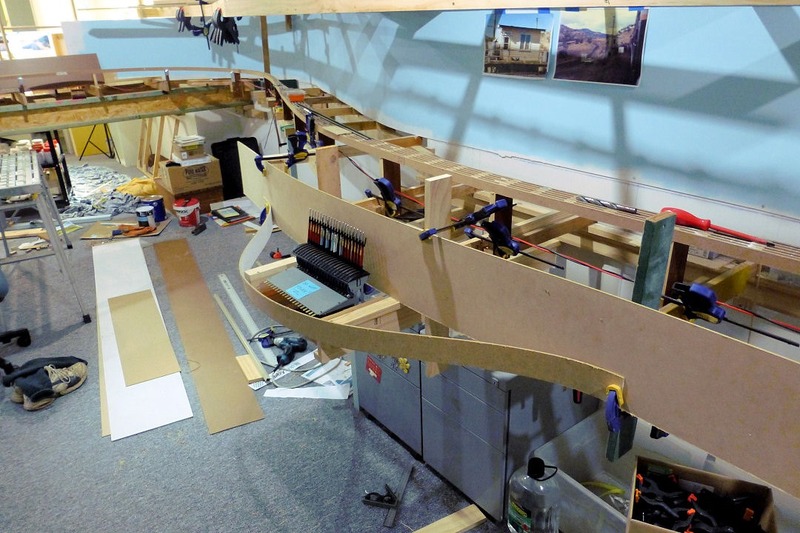 This section of spline has not been attached to the risers just yet. 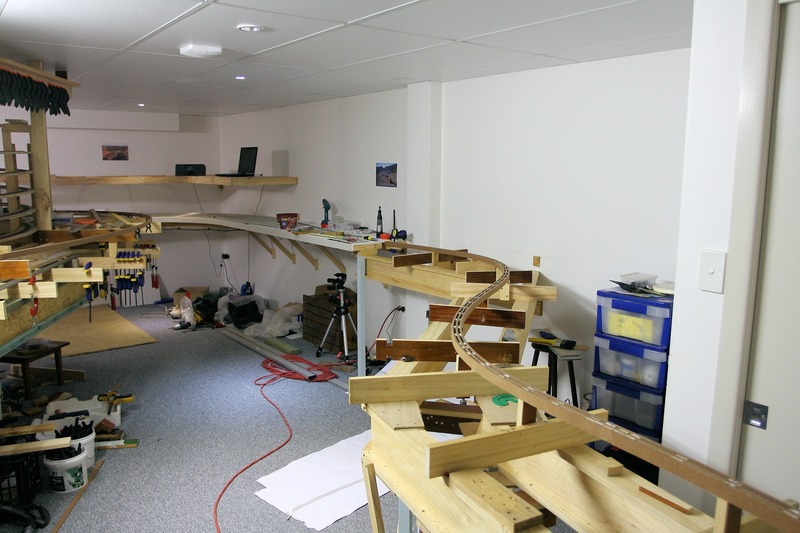 The first shot shows the spot where the bridge will go, showing completed spline either side. 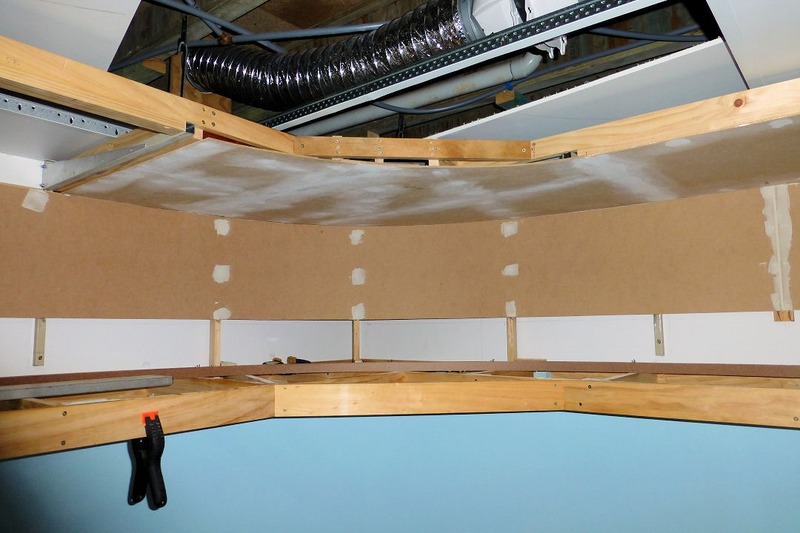 The second shows the spline in its final location on the risers. 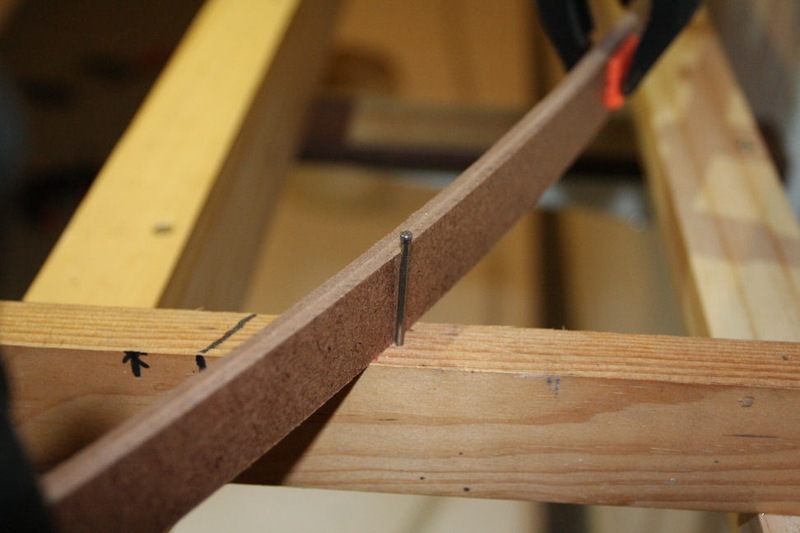 The third is a close-up of where the spline meets the ply, showing the difference in height to allow for the foam on top of the spline. 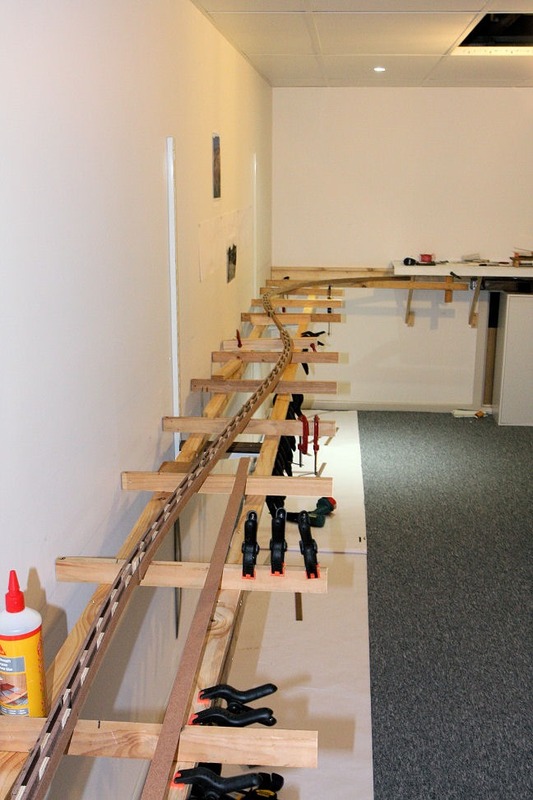 Today saw the installation of the first section of spline. YAY! I went to the hardware store to get some 6mm masonite to use for the spacer blocks, but could not find any. So I ended up getting a sheet of 1200 x 600 x 6mm exterior 5-ply. 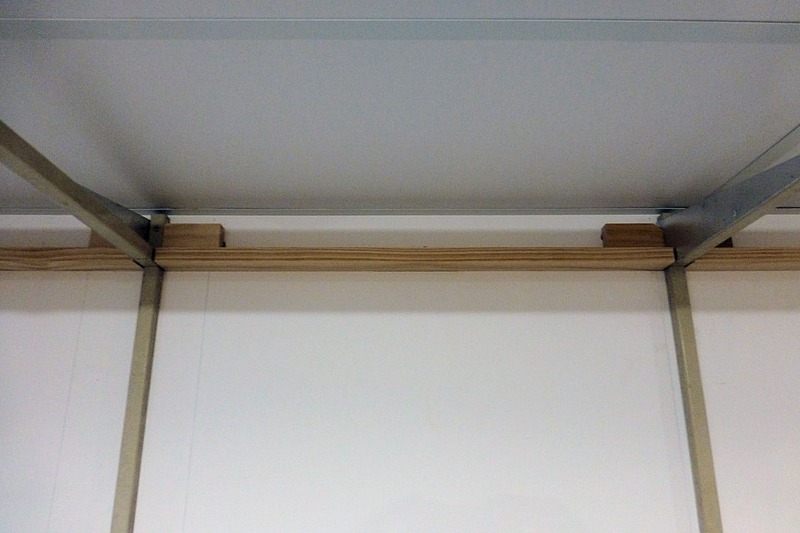 When I did the drawings for the spline last night, I was envisaging using 50mm long spacers. So I cut the ply into 50mm wide strips, and then docked these off to 25mm wide, same as the spline height. 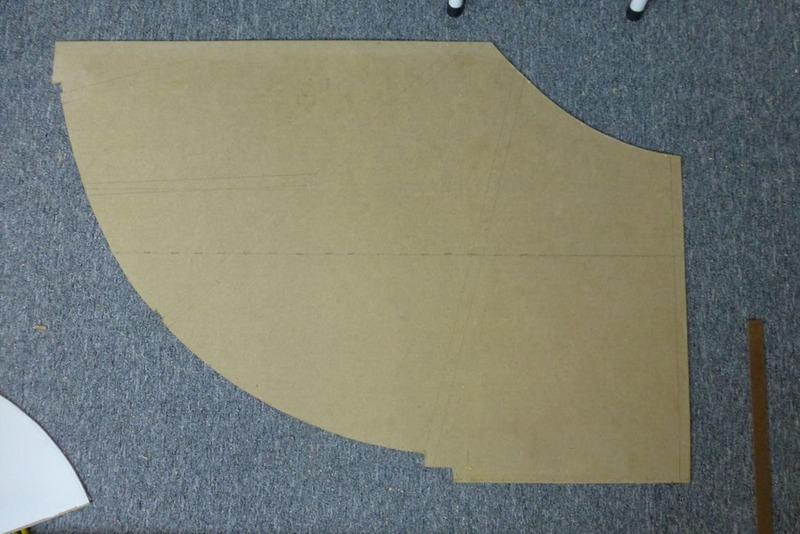 After docking about half a dozen ply strips, I then realised that 50mm would probably be too long for around the curves, so I test fitted a piece against my 40 inch radius template and found this to be correct. So I then proceeded to cut a quantity of the spacers in half which will work better on the curves. I’ll still be able to use the 50mm ones on straight sections and gentler curves. 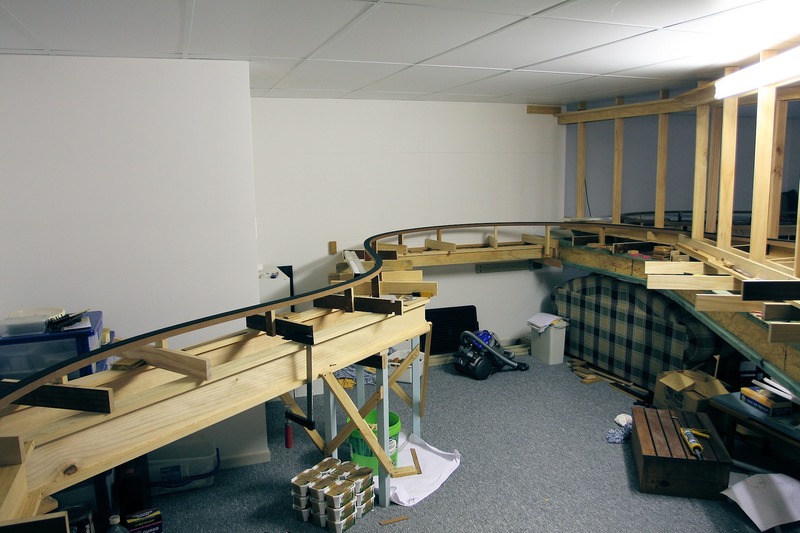 I then spent a few hours trying to get the first curve from the storage yard correct. 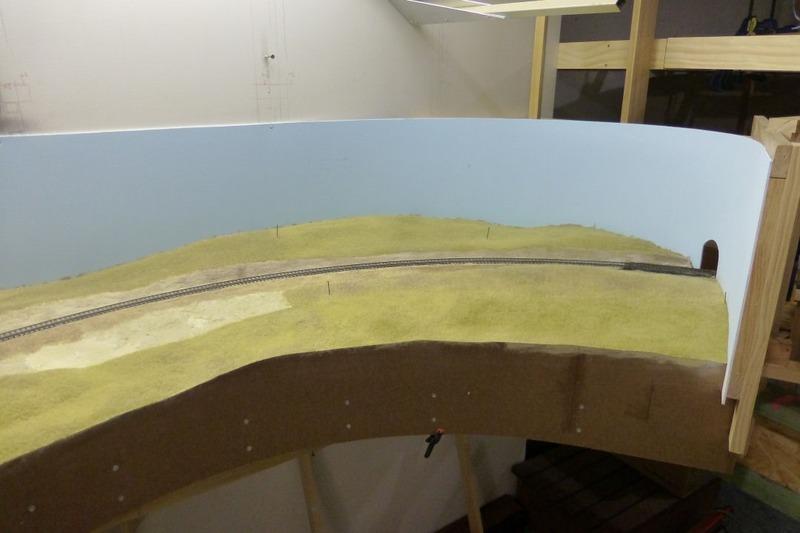 In the original plan, I wasn’t going to model the bridge over Chilcott’s Creek, which is at the start of the 1 in 40 climb to Ardglen. 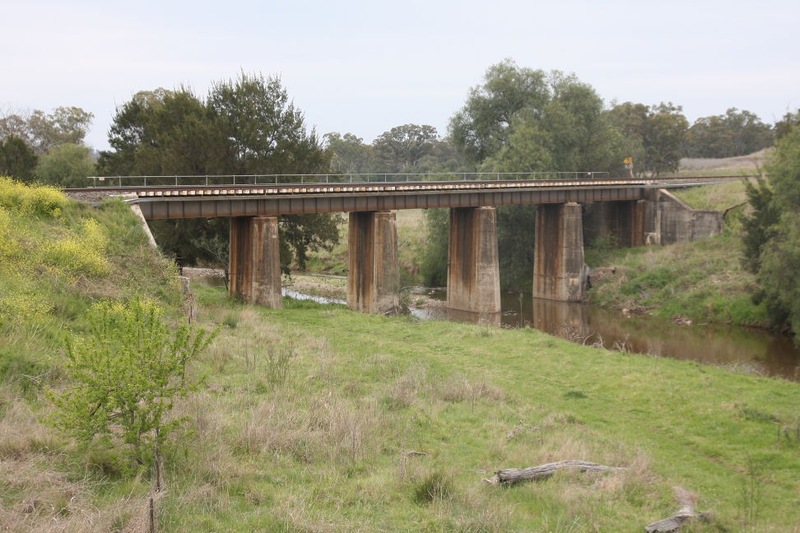 After taking some pictures of it last week on the way back from a few days at Dubbo, I am now going to model this bridge. After looking at Google Maps, I calculated that the bridge is 150 feet long with 5 spans each of 30 feet. 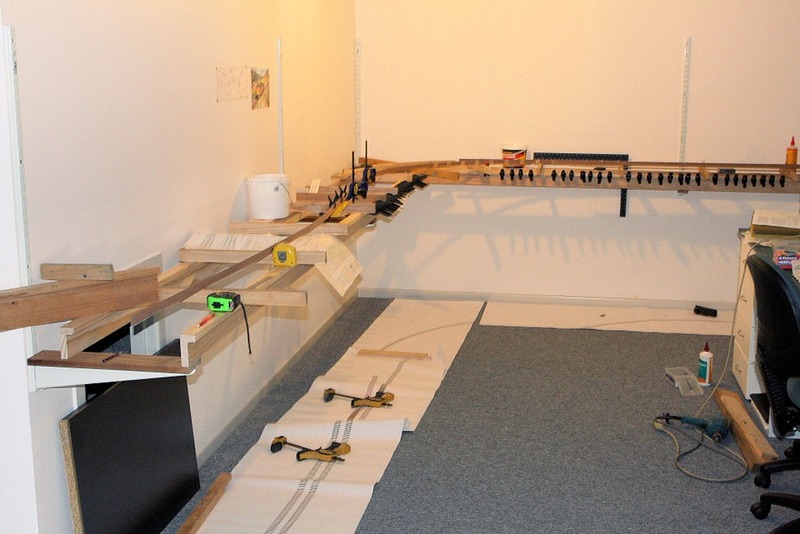 Micro Engineering make a 30 foot long plate girder bridge so I am looking at using this. More on this bridge later. Anyway, back to the spline. 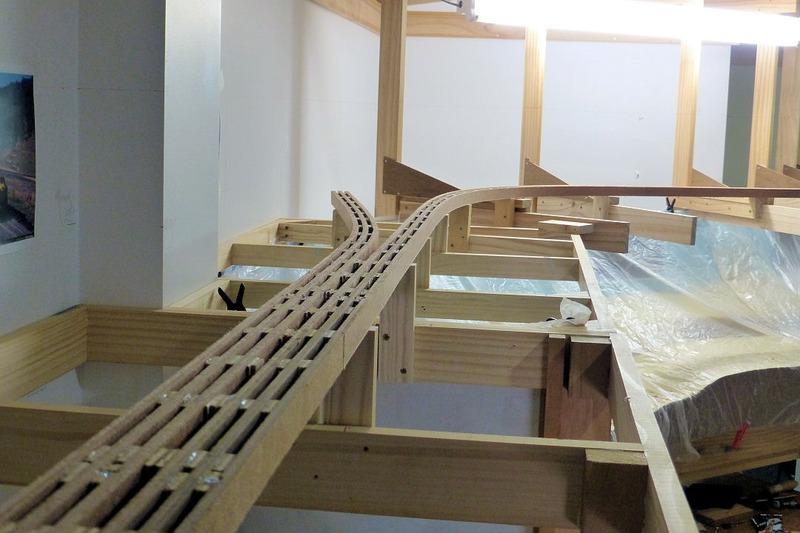 After some tweaking of the track plan to allow for the bridge and moving it slightly more towards the front of the layout, I came up with a slightly revised track layout for this section along the wall to Kankool. It’s not that much different from the diagram I have posted previously, but that is the beauty of using spline, in that it can be adjusted as you go. 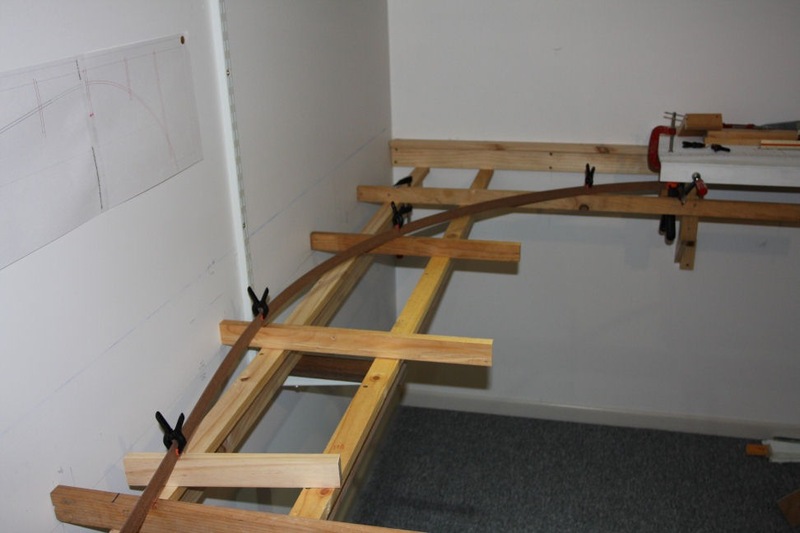 After making some centreline marks on the benchwork, I then devised a method to hold the spline underneath the storage yard ply just until the spline is complete, and then it will be raised to the correct elevation. I cut a short piece of L-girder that I had made previously. 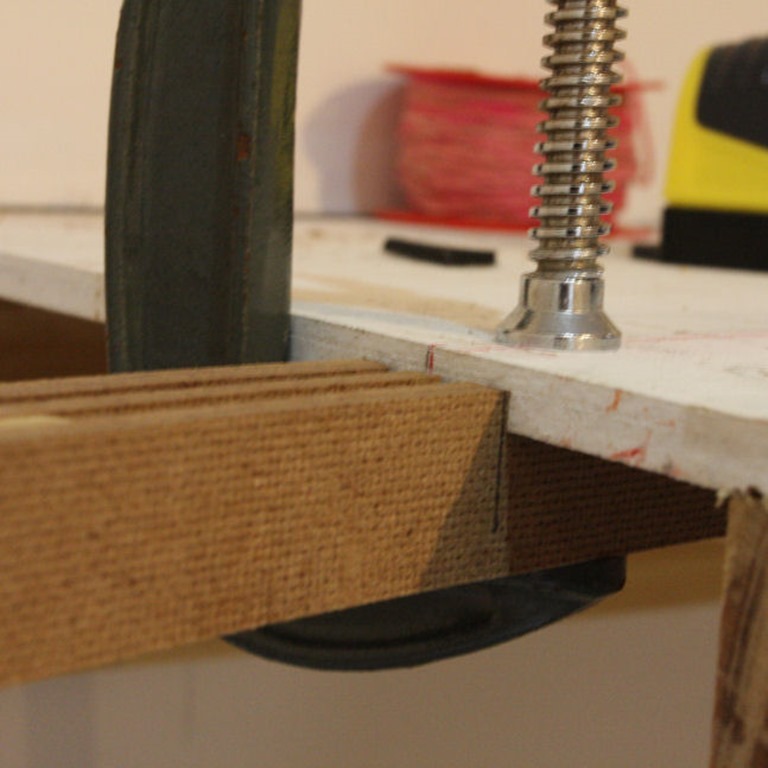 This was clamped basically in line with the easement on top of the ply, then the first piece of spline was clamped here. 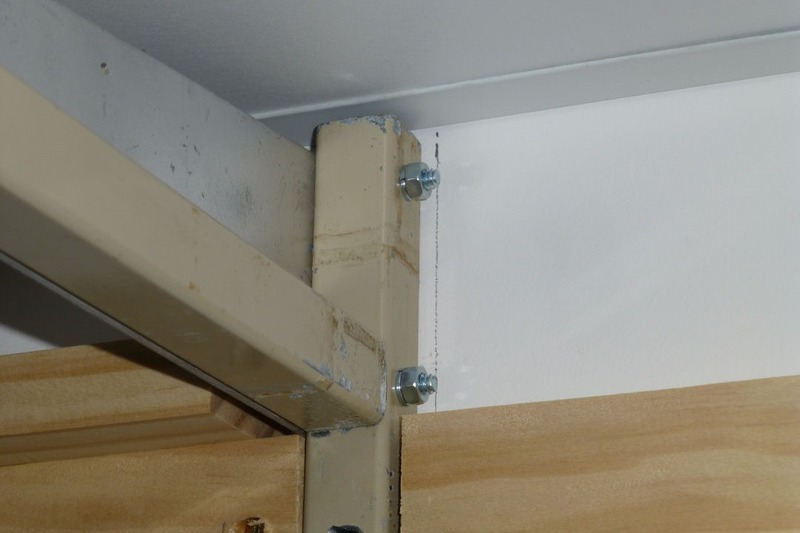 At the marks on the joists made previously, I drilled a small hole to allow for a nail to be inserted on the outside of the spline to hold its position. 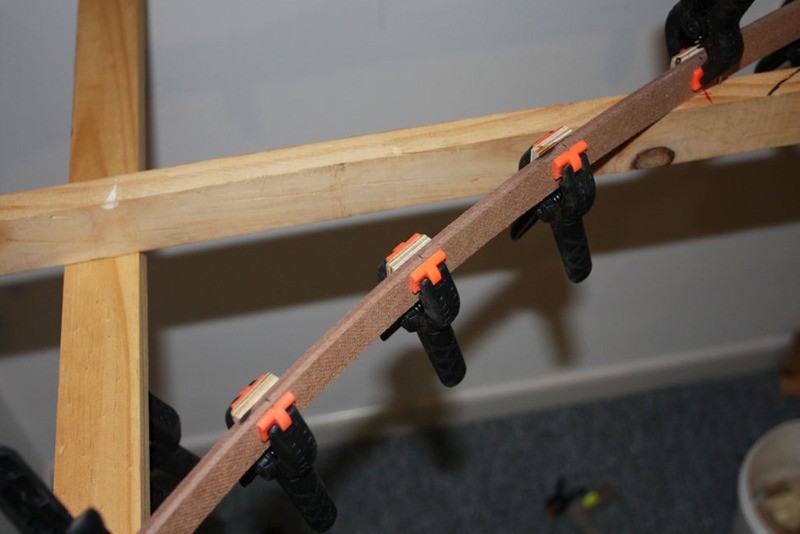 Once this first piece was in position, another piece of strip was cut a bit shorter so the joins are staggered, and was glued and clamped to the first piece. 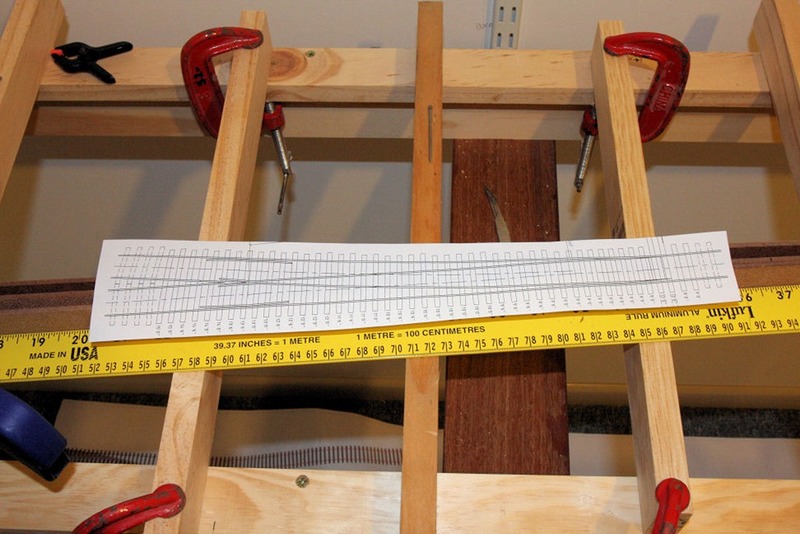 This first pair of strips forms the centre of the spline. This will be left to set overnight, and tomorrow I’ll add the spacer blocks and more strips and see how it looks. 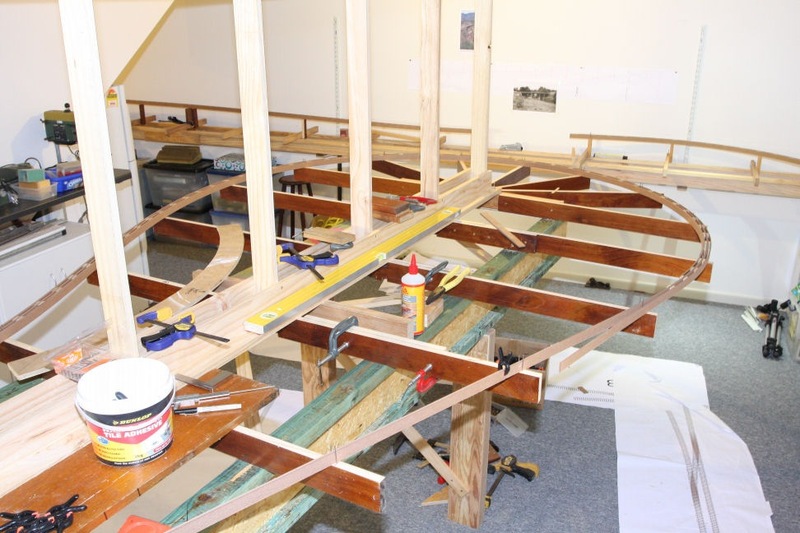 The short joist at an angle is the start of a tangent section of track where the bridge will be located. Just a quick post today. 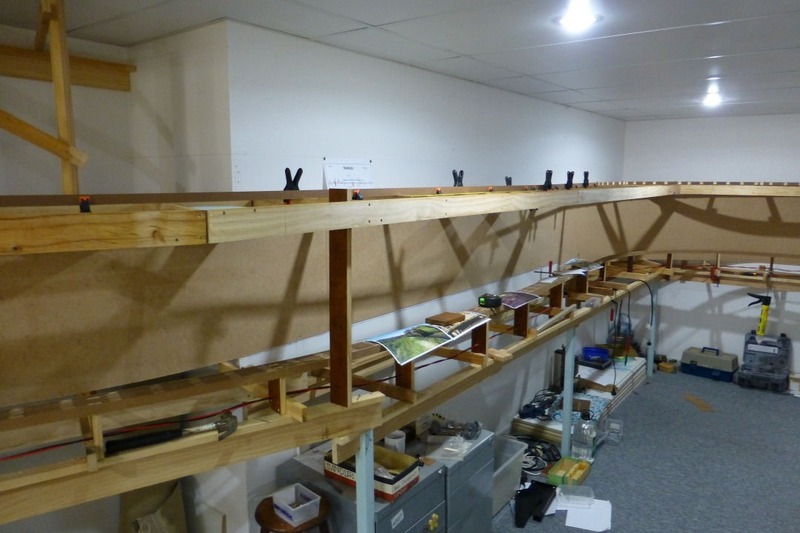 I have completed the benchwork for the storage yards, and applied a coat of undercoat this afternoon. I decided to paint the plywood for a number of reasons. 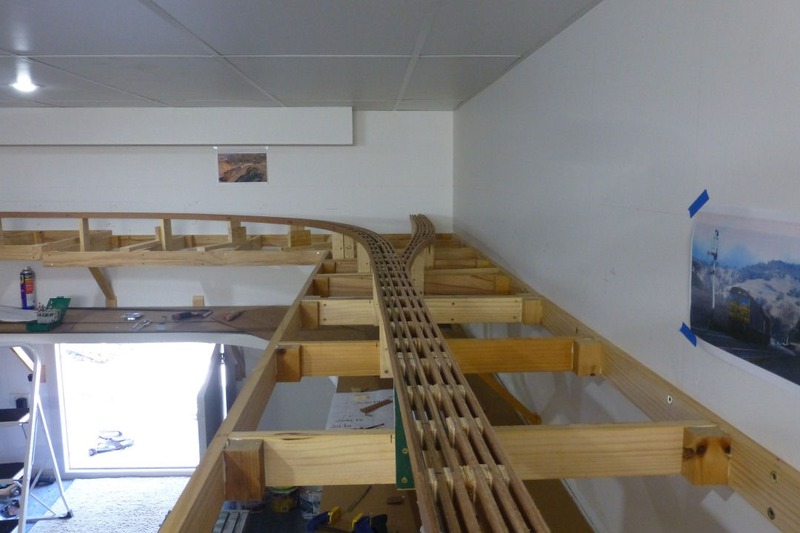 Over the weekend I hope to add a colour coat and then next week will begin the marking out of track centrelines and hopefully start laying some track.